St. Benedict of Nursia in the sixth century said, “The life of a monk ought to be a continuous Lent. Since few, however, have the strength for this, we urge the entire community during these days of Lent to keep its manner of life most pure and to wash away in this holy season the negligences of other times” (Rule of Benedict 49.1-3). On February 17, 2018, at the St. Rose of Lima Parish, Blanco, NM, we celebrated the final vows of Sister Agnes Le Doan. This has been a journey for her since she arrived September 2011, being accepted as Novice, and then 1st vows, December 2014. 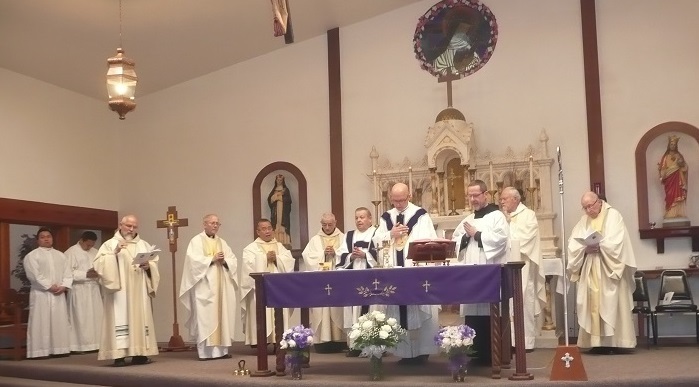 Delighted with this occasion, Bishop James Wall, of the Gallup Diocese officiated as main celebrant for the Mass and we thank all the priests, deacons, acolytes, Knights of Columbus, and the parishioners, who participated in any way. We especially thank Abbot Philip Lawrence and the monks of Christ in the Desert, who helped us with the music. 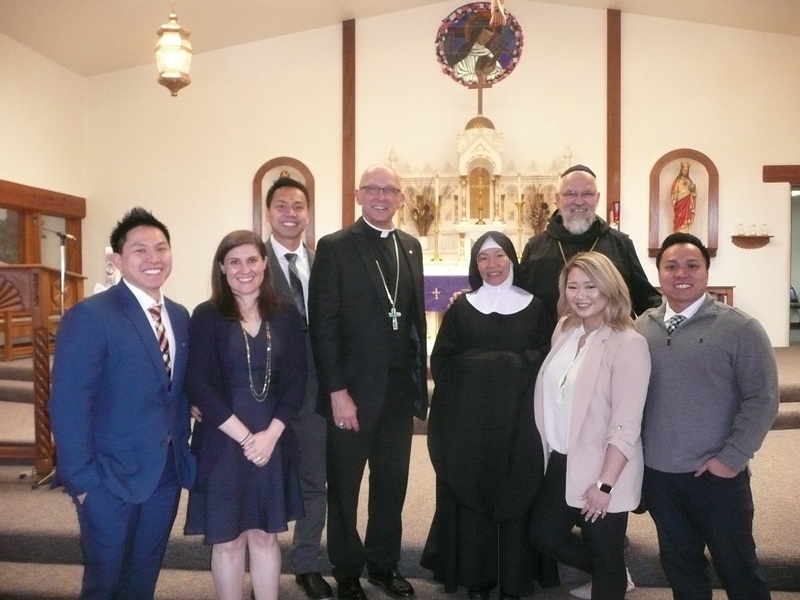 – After Bishop Wall’s sermon, there was a formal “Call to Profession,” when Prioress Hilda interrogated Sister Agnes Le if she felt the Lord is calling her to seek Him in this monastic community. S. Agnes, then read aloud the Chart of Profession, promising “Stability, Conversion of Life and Obedience according to the Rule of our Holy Father Benedict and the Constitutions of the Abbey of the Presentation of Our Lord in the Temple, Jamberoo, Australia, until death…” The Chart is then signed by S. Agnes, then by Prioress Hilda and also by Bishop James. 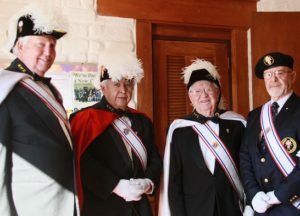 During this special celebration we continue with the Signs of Consecration, when S. Agnes Le formally receives the Cowl, the Veil, the Ring, and the Psalter. 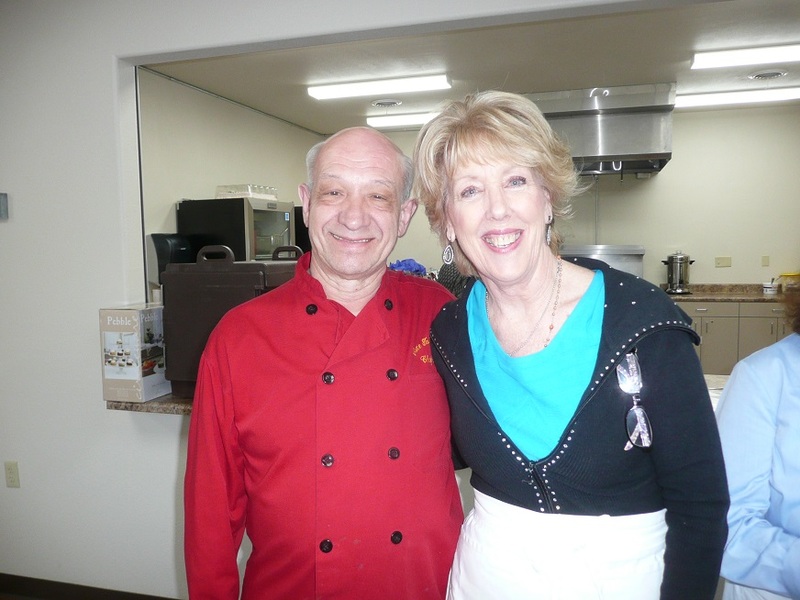 The Signs being ones of promising her Stability, Conversion of Life and Obedience made to God. 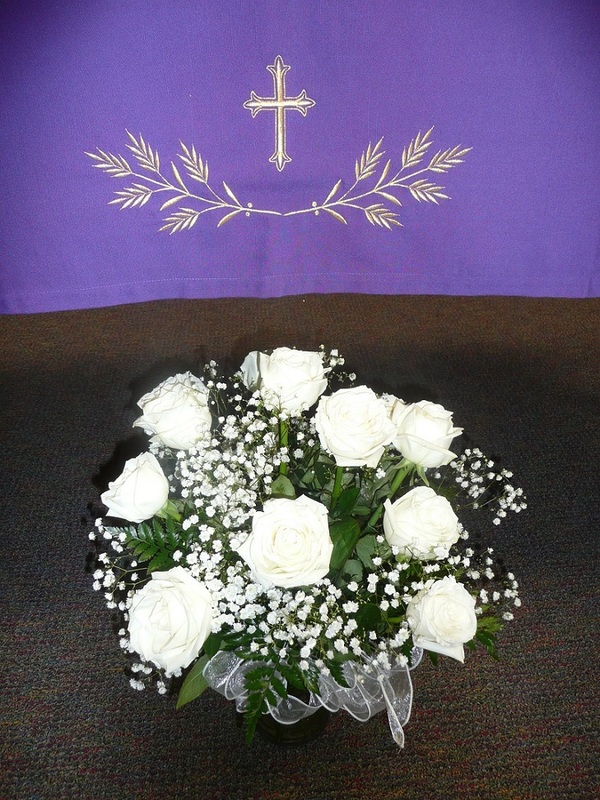 After S. Agnes received the Ring from the Bishop, Sister recited the espousal commitment. 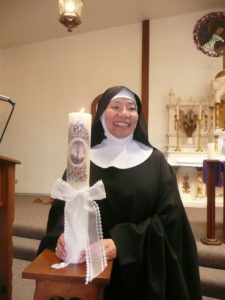 Please pray for the continued perseverance of Sister Agnes Le and during this Lenten season we pray for you and your intentions. 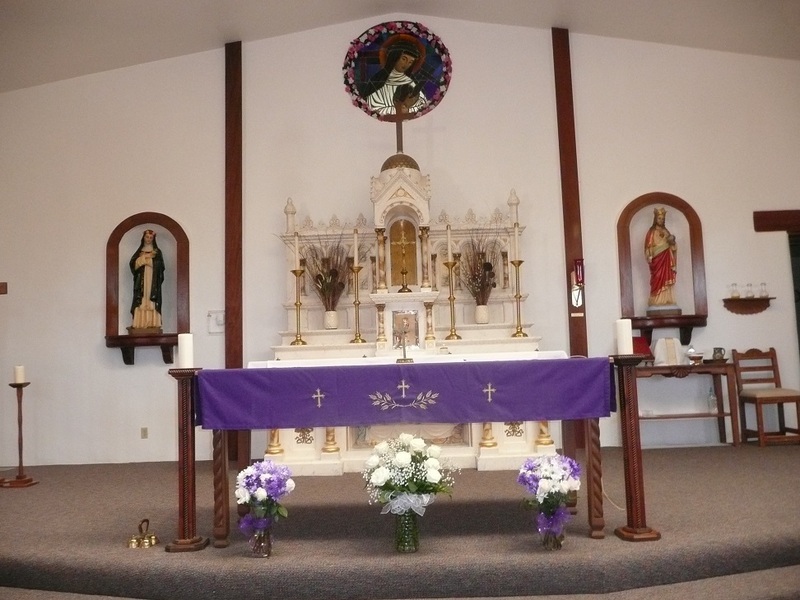 We also ask you to pray through the intercession of St. Joseph, we can build a new Chapel. 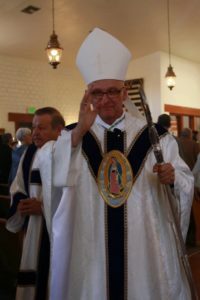 We were pleased to have Bishop James Wall, Bishop of Gallup officiate as main celebrant and thank all those who participated in any way. 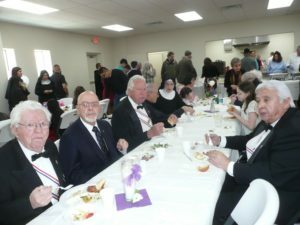 Here are a few pictures of the celebration. 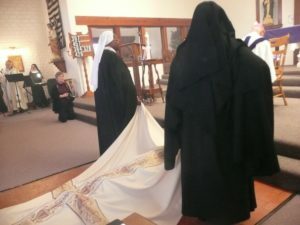 During the Litany of Saints, Sister Agnes Le prostrates on the floor in the center of the Church at the front of the altar and is “buried” under the pall. 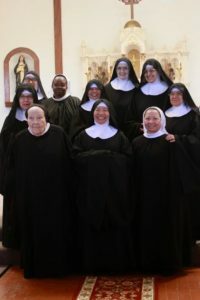 Sisters with Abbot Philip and some of the monks of the Monastery of Christ in the Desert.